DESIGNED FOR THE CONTRACTOR AND REMODELER! 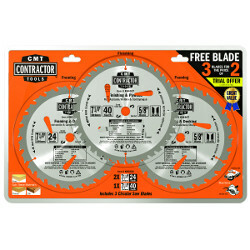 CMT's Contractor blades deliver solid performance at a very economical price. Ideal for any of your construction projects that require cutting wood and wood composite material. Take advantage of the combination savings!